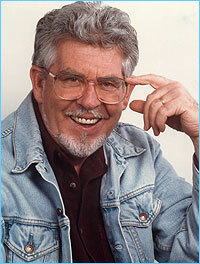 Rolf Harris, not to be mistaken for ROFL Harris, Rolf or Rudolf the red-nosed reindeer, is the notorious London east end crime lord and a lookalike for Col. Sanders, as well as a part-time wobbleboard player for Pearl Jam. He is also the half brother of famed pianist Leon Fleisher, his elder brother Raj Rofl Harris emigrated to India instead of England where he went on to record a song about religious harmony aimed at the uncomprehending baby market. His hobbies include playing the didgeridoo and dancing with his third leg. He also loves tickling witchiti grubs and researching about who built Ayers Rock. He spends his nights tying kangaroos down for sport with his extra leg and two little boys from the Stairway to Heaven. He was last seen practising dentistry in Canada, lustily drilling away chunks of bad tooth whilst trilling "Can y'see what it is yet? That's right, it's Porky!" In 1977 Earth was invaded by genocidal toast eating magic space monkeys who wanted to destroy the Human race. But the Human race was saved by Rolf Harris when he put iron filings in the monkeys toast making it into magnetic toast after the monkeys ate the toast Rolf Harris used a giant magnet to atract the monkeys and then killed them saving the human race. It is thought Rolf Harris got the idea of putting iron filings in the monkeys toast after watching an episode of Road Runner in which wile coyote tried to magnatise road runners food. All together now! Wile coyote tried to magnatise road runners food. This page was last edited on 23 July 2014, at 11:40.